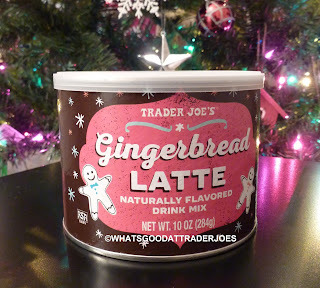 We've never had a stellar gingerbread product from Trader Joe's, at least flavor-wise, but we've never had a terrible one either. I mean, the flavor of cookie butter isn't such a far cry from gingerbread, but it's oh so much better than gingerbread, as most of you already know. It's almost a curse more than a blessing, because I kind of want everything labeled "gingerbread" to taste somewhat like cookie butter. I know, I know, they're two different flavors. Speculoos isn't exactly gingerbread. 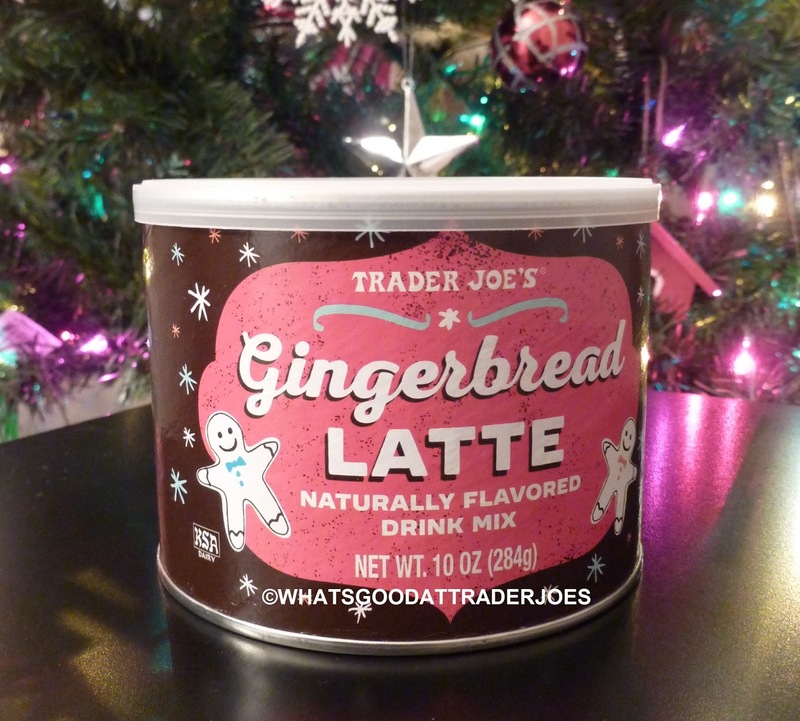 But that begs the question: why didn't TJ's just give us a cookie butter latte mix instead of a gingerbread one? Who knows? You'll rarely hear me complain about the texture of a beverage, but I'm afraid I'm going to have to here. There was a strange filminess to the liquid, for lack of a better term. I found it to have this unusual consistency regardless of whether we made it with almond milk or water. Strangely, I liked the mix slightly better with water than with any kind of milk. The milk almost made it too thick. Water yielded a concoction a bit more like a latte than a milkshake—and I guess that's a good thing, since they were apparently going for "latte" in the first place. The taste is like a bizarre, milky, liquefied gingerbread man. You can taste cinnamoniness and nutmegginess, but there's also some other unidentifiable flavors mixed in there. The whole thing gives way to an unpleasant aftertaste and makes you want to drink something else to cleanse your palate. It's almost like drinking a slightly watered-down, gingerbread-flavored creamer—an additive intended to be consumed as a secondary ingredient in a normal black coffee or tea. It's not the worst thing I've ever tried, but it's mostly an unpleasant experience in my humble opinion. 2.5 stars from me. Same from Sonia. She says it needs more espresso or coffee flavor—and it's very rare for her to crave more sugar, but she thinks this mix might be a little better if it were sweeter, too. I'm not so sure that's the problem, but I can't really put my finger on what is. Dare I ask...what did you think of it? Are we being too harsh? Are we being grinches? Did you discover any preparation methods or additional ingredients to make it more palatable? Bottom line: 5 out of 10. Speculoos Latte! That sounds so good. I just returned the gingerbread latte I bought (exchanged for the Camembert Cheese and Cranberry Sauce Fillo Bites- very good trade). You are so right about the texture. I didn't realize at the time because I was so distracted by the flavor. They should have named it GINGER-bread. The ginger is overpowering. And while some weird flavors go with coffee (maple, blueberry, pumpkin) ginger is not one of them. Try the chocolate raspberry tamales! I was floored how yummy it was!!! You don't taste the corn at all. It like a brownie with a hint of raspberry in it. Gooey at some spots. It is gluten free which is awesome. Chocolate raspberry tamales sound amazing! Chocolate raspberry tamales sound terrible to me, but Aleksandr's description of it being a "brownie with a hint of raspberry" sounds great! I may have to be adventurous and try it out! This is the only thing I've ever returned to TJs, it sounded so good, but tasted so bad! I had taste tested it at Trader Joes a week ago. The person next to me and I both made faces at the server upon trying it. She looked a little uncomfortable and then said it wasn't everybody's cup of tea. Uuuhhh in my opinion its not anybody's cup of tea, coffee or any other type of beverage!!! A negative 5? Now that's just mean. Hey as awesome is Trader Joe's is they are bound have a dud now and then. I'll concede and give it a 0.5 star. For people to purchase it and actually take the time and effort to return it I think certainly makes it one of the top 3 worst new products of the year. Just drank a whole cup. Not sure about this one either. Leaves a taste in your mouth. I like the sweetness of it though. I made mine with warm milk. It never dissolved all the way. Ahh I bought this anyway against your warning.! I really wanted to try it since I love all seasonal flavored things!!! Also picked up and Wassail juice/punch-you have to try it---it is delicious! That ingredient list explains a lot. 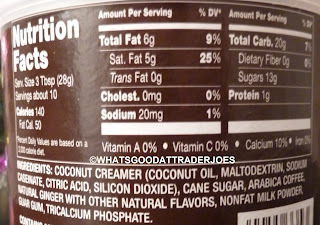 The "coconut creamer" with coconut oil = filmy mouthfeel issue and why it tastes like flavored creamer- it is!! I actually love this drink mix - I'm on my second canister and plan to stock up before it disappears post-holiday season. 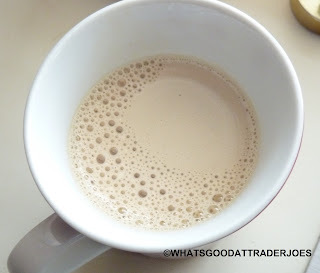 I tried the Pumpkin Spice Latte drink mix and it was too sweet with a nasty flavor. I love that the Gingerbread Latte is less sweet (sorry, Sonia) and it gives me just enough coffee flavor (I don't drink actual coffee) to feel like a grown-up alternative to cavity-inducing hot chocolate. I just tried this for the second time mixed into a cup of coffee. Sadly it doesn't improve it much. I absolutely LOVE the gingerbread latte mix. Such a good treat on a cold day.